Free shipping on all products purchased online. Payment is required with order, unless prior arrangements have been made with Flying Colours. When you place an order, either by telephone or in writing, we will treat it as an offer to buy from us. All orders for the supply of goods placed by the Purchaser are irrevocable unless otherwise expressly stated in writing. A confirmed order may only be cancelled or varied with Flying Colours written consent. Such consent shall not in any way prejudice Flying Colours right to recover from the Customer full compensation (including profit) for any loss or expense arising from such cancellation or variation of the original order. Flying Colours reserves the right to vary the price of the goods and other services from time to time. All prices for goods are quoted exclusive of taxes and duty unless otherwise stated. The Customer accepts that the goods will be invoiced at the price ruling at the date of dispatch (unless otherwise stated on the Company’s quotation). All prices are in Pounds Sterling and do not include VAT until the checkout. Any exceptions will be clearly marked on the website where relevant. Prices may be subject to change without notice. Set up fees on new orders, if applicable, are a one off charge to cover the cost of labour and administration. Typically a left hand chest size design costs £20.00. A more complicated or larger design may cost more. We will waive the set up fee on orders over 25 garments. Any digital files or screens remain the property Flying Colours and are not transferable. If you would like your logo file on a disk in embroidery machine format there is a charge of £20.00 plus VAT to release this. Embroidery designs on new orders will be digitised and sewn on a sample swatch and emailed to the customer to approve or advise Flying Colours of any amendments required prior to starting work. a. Absolute consistency of sizes (which are approximate “to fit” sizes), materials, proportions, colours and shades are not guaranteed by Flying Colours and are given as guidance only. Decoration positioning may vary between garments up to 25mm. On those occasions where repeat orders find that the garment colour is slightly different to the previous order, Flying Colours cannot be held responsible for those changes. b. All textile goods must be washed and cleaned strictly in accordance with the washing label instructions attached to the goods and as described in the FAQ section. We reserve the right to alter or amend specifications without prior notice. Considerable care is taken by Flying Colours at all times, but we cannot be held responsible for damage or loss which occurs to garments which have been supplied by the customer. Examples of damage may include, but not be limited to, the garments changing colour or shape due to heat, or damage caused by machinery malfunction. Plain samples must be returned within 2 weeks to receive a refund. Delivery charges are non refundable. Garments must be in the same ‘as new’ unworn condition. Items shown on this website may not always be in stock. If any of your chosen items are not in stock, you will be advised of our best estimate of availability and delivery date at the time you place your order. Please note that an indication of such dates is an estimate only, may be subject to change without notice, and does not constitute a contractual obligation by Flying Colours to supply goods by a certain date. However, if availability is unduly delayed, we will use our best endeavors to keep you informed. We are confident that our garments are of excellent quality and can meet customers’ requirements. There is a possibility that garments will arrive with a small indentation mark around the embroidery where the garment has been held in the embroidery frame. This will wash out. Please note that the colour of images shown on this website may be affected by the technology used to access it. Whilst we do our best to faithfully reproduce colours, some variation may occur. All claims in respect of shortages / goods alleged to be defective must be made in writing within 7 days from the date of delivery. Property of any goods supplied to the Customer will not pass to the Customer until the goods are paid for in full by the Customer. Further, title to such goods shall not pass until payment to the Company of all amounts owing to it by the Customer on any account whatsoever. The Company has the right to recover from the Customer the cost of installation, removal, return transport and diminution in value of any such goods not paid for in full. Flying Colours reserves the right to refuse cancellations of confirmed orders placed by the Customer, and refuse acceptance of goods returned to the Company without permission. Returns are normally accepted provided we have been notified within 7 days after delivery. Your product must be complete, unused and in ‘as new’ condition (e.g., if you have opened the box to examine the product you must have done so without damaging or marking the product in any way). It should be returned with the original box, packing and accessories. Buyer pays for return carriage. Customised goods (embroidered or printed) are exempt from the 7-day right to return and are non-returnable except for genuine defects. In such cases, please let us know as soon as possible if you are not happy with your order, and once the garments are returned to us, we will arrange replacements. Delivery to mainland addresses within the UK is free, for international orders please contact us with your details for a quote. Orders usually take 10-15 working days although earlier deadlines can often be met – please let us know if you have a special request. Flying Colours will use its best endeavours to deliver the goods on or before the estimated date for delivery, but does not guarantee to do so. Flying Colours shall, under no circumstances whatsoever, be liable to the Customer for any loss, damage or expenses, whether caused directly or indirectly, by or from any delay in the delivery of the goods. Claims for shortages or non-delivery must be supported by the carrier’s consignment or delivery note on which the goods have been signed and checked at the time of delivery. All claims for shortages or non-delivery must be made by telephone within 3 working days and in writing within 5 working days. Any loss or damage by the Customer after delivery is the sole responsibility of the Customer. Transit Damage – All goods are examined in detail by ourselves prior to despatch to ensure that they leave us in perfect condition. However, transit damage unfortunately can occur. If your purchase is showing obvious signs of transit damage upon delivery, please refuse to accept delivery and notify us immediately. If damage is only evident upon opening of the packaging, then you must inform us within 48 hours of receipt. In either case, we will then arrange re-delivery of replacement goods as soon as possible. We trust in good faith that you have the permission to use the material that you ask us to work with. You will indemnify us from and against all costs, claims, liabilities and damages which we may suffer or incur as a result of you using, reproducing or exploiting any industrial or intellectual material or property rights without the consent of the proprietor. All contracts between Flying Colours and Customers shall be governed by the laws of England and any disputes arising there from shall be the subject to the jurisdiction of the English courts. All orders are subject to these terms and conditions and no amendments will be accepted by us. 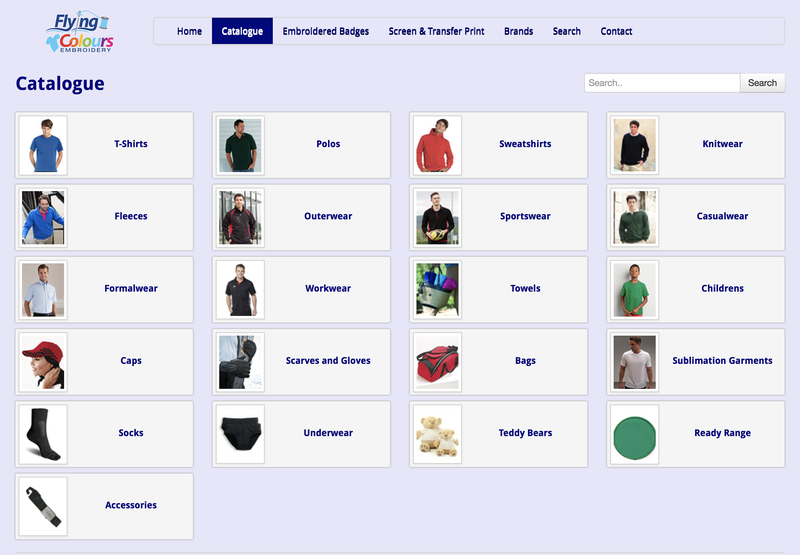 See our full range of products available to order, not available online.